Be confident as you stride towards your ultimate destiny. Everything started with mushrooms. Velvet pioppinis, to be exact. Pat had never even heard of those before, but apparently they were actually a thing, rather than the off-color joke they sounded like. The AI ignored him, which was not surprising because it couldn’t hear him. It continued to fill the room with the soft throbbing sound that signaled an urgent task awaited doing, and someone had better get on it double-quick. For all that it was quiet, the throbbing was pretty annoying, and also managed to convey an astounding level of judgment. Aha — score! Velvet pioppini mushrooms. Pat fished the neatly labeled box from the farthest corner of the fresher drawer, set his prize on the counter with a triumphant flourish, and sauntered over to the AI interface at the end of the kitchen island. Hitting the ‘confirm order’ button shut the thing up at long last. Yeah. Billionaire, genius scientist and famous superhero Nicholas Andersen liked to have his middle-of-the-night in-house pizza served in cheap cardboard take-out boxes. Whatever; Pat didn’t judge. He figured that when you had as much money as three major governments, you got to do pretty much whatever you wanted. Besides, pizza boxes were pretty cool. You could throw the crusts and any weird icky bits on the lid, and when you were done you just closed it all up again and let the leftovers congeal in peace. Convenient. Billionaire superhero geniuses were just normal guys in the end, right? Except, of course, that billionaire superhero geniuses had a personal five-star chef to prep all the ingredients for their midnight pizza experience, the stasis field to keep everything nice and fresh… and the night manager to prepare the pizza according to the ten-page instruction manual, which detailed exactly how it was to be assembled, baked and cut in order to conform to said billionaire’s personal preferences. Pat added a careful sprinkle of fresh herbs to the perfectly cut pizza before boxing it up and arranging it in the dumbwaiter. 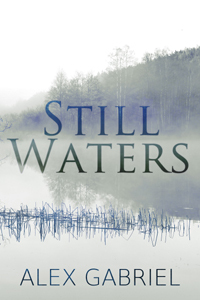 A bowl of lemon water and several snowy linen napkins, silver cutlery, a long-stemmed glass, and a bottle of red wine that probably cost more than several years’ worth of Pat’s salary — and it was done. Pat high-fived the AI interface, and then high-fived it again with his other hand because he’d missed the ‘delivery ready’ button the first time around. The AI paused the music in order to ping acknowledgment, proceeding to purr contentedly as the dumbwaiter’s steel doors whizzed shut. Another instant, and the contents were whisked off to their destination. Unsurprisingly, the AI neglected to start up €linore again. Pat took this as a passive-aggressive comment on his taste. Whatever — Pat wanted to study now, anyway. He quickly typed up the pizza event and sent the account off to the mansion’s database. Then, he tidied up and settled down at the small table in the corner, kicking up his feet comfortably. The huge chromium coffee machine was just within reach, if he tipped back the chair. He’d perfected this maneuver his first two nights and now hardly even thought about it, balancing on two legs of the chair like a pro while he stretched back to mash the button with his cup, quickly swerving to catch the resulting stream of coffee. Right, then. Back to the drawing board. Or rather, the books; he wasn’t at the drawing board stage yet, though he’d already put his name on the waiting list for Urban Design Studio I next semester. It was History and Theory of for now, though. Which, no problem there. Pat dug that stuff, especially environmental theory, which was wicked cool. He’d just sunk his mental teeth into a particularly recalcitrant article on environmental management (the author appeared to think he could score points by wrapping up simple concepts in impenetrable phrasing) when the AI chimed another demand at him. “Direct unclassified request by principal, location private laboratory. Recording available. Please press 1 to play and 2 to repeat playback.” Was it Pat, or did the AI’s pleasantly bland voice sound a bit perkier than usual? Maybe it got bored during the night shift, when there was nothing much to do but cater to Andersen’s predictable midnight pizza cravings. It might well have just been Pat, though, because: Cool, his first unclassified request! So far, the most exciting thing that had happened on one of his shifts was Andersen’s unprecedented request for mousse au chocolat. This job was a front-row seat to the wild nights of the obscenely wealthy, seriously. “So, send up a guy,” said the recording. The sound quality was crystal clear, the voice unmistakable, even if Pat had so far only heard it on TV. He replayed the message twice, but there was no more information to be had. Andersen wanted to talk to someone in person. Maybe he had some kind of dire pioppini emergency he could only adequately convey face to face. The official manual How to Take Care of the Rich and Famous went on about this kind of thing in three hundred pages of tiny print. Not that Pat had read it, of course, but Suze (officially Assistant House Manager Susan Wainwright, aka “AHM Wainwright or Ma’am to you, Mr. West”) had held a stern speech about it, too. Plus there’d been that one-week training seminar which had basically boiled down to ‘get it done, stat, and be pretty, neat, and preferably invisible while you do it’. Rule Number One was, simply: Whatever Andersen wants, make it happen. Pat wasn’t sorry to get a break from this weirdo author’s convoluted sentence structure, that was for sure. His brain had gotten all knotted up trying to follow the man’s train of thought. Plus, Pat would get to see the lab, and come on, who wouldn’t want to see Silver Paladin’s lab? Pat was only human. Andersen looked different than he did on TV. Granted, he was usually on TV in the Silver Paladin get-up, all skin-tight quantum armor, mirrored visor, and glowing force fields. But Pat had seen him give interviews as himself, too, and somehow he’d assumed the dude was… whatever, he didn’t even know. Andersen wasn’t short or anything (in fact, he was probably half a head taller than Pat, which made him pretty damn tall by anyone’s standards). Young for a rich scientist-type dude; maybe a handful of years older than Pat, but not ancient. He looked pretty built, too, as befitted one of the world’s foremost superheroes. His shoulders even strained the sweatshirt a little. It was just, he looked so normal. Right down to the half-annoyed, half-startled look he was wearing right now, and the way he was eyeing Pat as though he wasn’t certain whether or not he’d heard right. Pat got that look a lot, so he recognized it right away, even on a face he’d previously only seen in ‘public speech’ mode. Which was when the backdrop of equipment in the hangar-like laboratory came into sudden, sharp focus in Pat’s mind. Ooops. In the cavemen v. astronauts scenario, there wasn’t much question which side of the divide Silver Paladin — with his force fields and stasis shields, power lances and other high-tech gizmos — would be on. Pat could feel his face heating under Andersen’s stare. The dude had really dark eyes, and he could stare like nobody’s business. Like he was going to set you on fire with the power of sheer derision or something. Seriously, this place was awesome. Daylight-bright and white and silver and crammed with more mysterious devices in various stages of assembly than Pat had seen in any real-life mad scientist’s lab, ever. He wasn’t an expert, but he was pretty sure that was an electron microscope over in the far corner. Not to mention the place was huge, with high ceilings giving it an almost cathedral air. The two far walls were completely mocked up with screens pretending to be windows opening on a blasted alien moonscape. Pat was pretty sure he’d been gawking for too long. When he looked back to Andersen, the dude was smirking, a self-satisfied little lift to his mouth that destroyed any remaining hint of resemblance he might have had to the heroically square-jawed Silver Paladin persona. A short beat of silence followed this pronouncement. There was a distinct judgmental cast to the narrowing of Andersen’s eyes. Pat probably shouldn’t have grinned, at least not quite as broadly as he did, but he couldn’t help it. Total debating slam-dunk. No nicknames, huh. Pat might (or might not) have rolled his eyes the tiniest bit. He suspected he needed a bit more practice at the ‘serving humbly and invisibly’ part of this job, but in his defense, Andersen — Nicholas — was making it pretty difficult to take him seriously. Pat’s parents had taught him better than to take superheroes seriously anyway, and right now, wearing that vaguely confused, vaguely pissy expression, the man looked constipated more than anything. It was neither a very imposing nor a very heroic look. Of course, Pat supposed superheroes got constipated just like everyone else. It just wasn’t the kind of thing you usually associated with them. Unlike awesome powers and booming voices and bulging muscles, and being all one-dimensional, judgy and prone to blasting first and asking questions later. Apparently, the answer to that was ‘stand right there while I take off my sweatshirt, my t-shirt and then my jeans, and in case you were wondering, yes I do work out a lot, thank you for noticing’. “Uhm,” said Pat. The bulging muscles stereotype clearly existed for a reason, although ‘bulging’ was kinda the wrong word. Pat would have chosen ‘perfectly sculpted’. You know, if anyone had asked. Which — was that him asking? It certainly looked like the guy was expecting a comment of some kind, considering he was standing there in his boxers, staring at Pat as though Pat was the one behaving like a confirmed nutcase. ‘Perfectly sculpted’ jumped to the tip of Pat’s tongue. He bit it back just in time. No need to give Silver Paladin’s civilian alter ego a swelled head. Gorgeous broad shoulders and ridiculously lickable abdominal muscles notwithstanding. 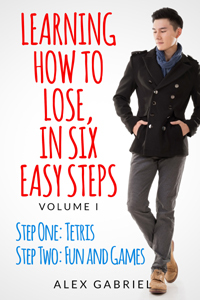 When Pat managed to drag his gaze up to the man’s face again, Nicholas was rolling his eyes. Seriously? Dude, spontaneously undress in front of a guy and even crazy rich superheroes had to expect a little ogling. “Yes,” said Pat’s mouth, completely without intervention from higher brain functions. 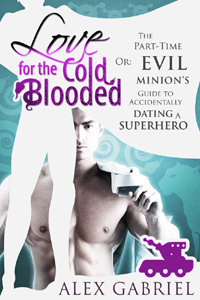 Read the rest of Part-Time Evil Minion Pat and Silver Paladin’s story in “Love for the Cold-Blooded”!